Higher Fringe Benefits Tax – How Does It Affect Your Business? FBT increase from 47% to 49% – how will that affect the structure of your payments to your employees? 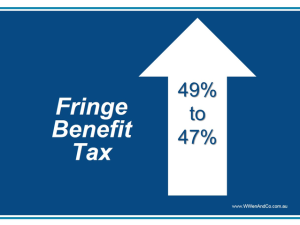 From April 1, 2015, the rate of fringe benefits tax (FBT) will increase from 47% to 49%. The rate is expected to return to its present level two years later. When the FBT rate increases next April, many small businesses are likely to be affected. If you are an employer, you may want to reconsider your current fringe benefit arrangements with employees who will be impacted by this increase. Salary and allowances or fringe benefits? Employees on packages of less than $180,000 a year may be better off with additional remuneration via salary and allowances rather than fringe benefits after April 1st 2015. For example, if you are an employer who provides benefits such as paying for an employee’s private health insurance, it may be a better for your employees if you provide additional salary, which would be taxed at a much lower rate than 49%. For further tax advice regarding FBT, please contact us at our Epping office on (02)9872 7865.